In metropolitan Atlanta, locals commonly refer to the complex roadway intersection where Interstate 85 meets Interstate 285 as Spaghetti Junction. But it's not the only interchange to earn the descriptive moniker. Just beyond and below the city limits, the intertwining wires that power the airfield lighting system for Hartsfield-Jackson Atlanta International Airport (ATL) inspire the same nickname. 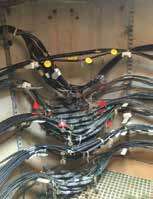 In total, the system includes 600 miles of cabling, segmented into 160 individual circuits with an average length of 3.8 miles. "As you build a runway or a taxiway, you add wires in over time," explains Quintin Watkins, senior project manager and assistant vice president of the engineering unit at Michael Baker International. "It looks like a bowl of spaghetti." In ATL's case, the bowl grew over the course of four decades of airfield development; and the airport recently completed a $6.6 million project to map each strand of its underground spaghetti. ATL executed the project through an on-call design contract with Aviation Infrastructure Solutions, a joint venture of Michael Baker International, Pond and Company, and Corporate Environmental Risk Management. The team's mission was to review the status of existing airfield electrical system documentation to determine the completeness of its data and recommend system improvements. 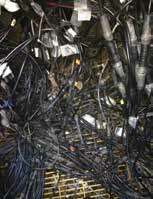 Data collection and documentation began in June 2015, and circuit verification was completed in March 2017. 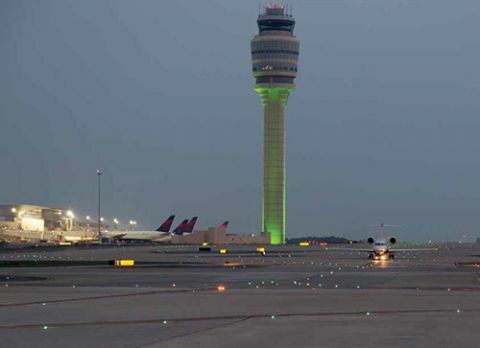 Project officials explain that documenting the existing airfield lighting system infrastructure as thoroughly as possible was a major step toward meeting ATL's overarching goals of safety, operational reliability and financial prudence. The scope of the project included the entire airfield lighting system infrastructure and spanned three sections of the airfield-North, Center and South. The effort also encompassed the electrical distribution system, communications system, duct banks, manholes and airfield signage, notes Watkins, who served as project manager of Aviation Infrastructure Solutions. The team began the onsite portion of the project by collecting data through a point-by-point survey originating at the airfield lighting vault and extending out to the last light fixture or sign on each circuit. During the process, personnel traced every cable, duct, manhole, pull can, light fixture and airfield guidance sign along the way. "The airport is continuously evolving and growing," explains ATL Aviation Engineer Chris Rogers. "There are projects on top of projects, and our goal was to try to collectively grab the information from all of those projects and verify and paint an accurate picture for the status of the system to date." Aviation Infrastructure Solutions was the "painter" responsible for transferring data to drawings. It also created three-dimensional designs of the electrical system showing all circuit routes using AutoDesk Utility Design, compiled spreadsheets and provided ATL with a base document for ongoing management and improvements to the airfield electrical systems. ATL officials anticipate that the recently completed project will benefit the world's busiest passenger airport in numerous ways. Armed with updated, real-time information, airfield maintenance personnel should be able to perform their day-to-day tasks more efficiently and accurately, thereby reducing the downtime needed for troubleshooting and repairs. Similarly, the new data is expected to benefit operations personnel who report anomalies in the airfield lighting system during their visual inspections. The comprehensive mapping project should also facilitate more accurate planning budgets and assist engineers as they produce designs for future construction documents, notes Rogers. "The goal was to collect information to verify information that we had and information that we didn't know, and to bring all of that together," he explains. "We felt as though the accurate information would get us the ability to maintain efficiency going forward from the perspective of design, maintenance and even operations." With valuable data in hand from the recently completed mapping project, the airport plans to bid out a subsequent project to remedy redundancies and correct any anomalies, says ATL Department of Aviation Project Manager Kenny Goggins. "We are going to save money in future maintenance, future construction, and future emergency personnel operations because we know what is going on out there," he remarks. While impossible to quantify precisely, ATL anticipates saving hundreds of thousands, if not millions, of dollars thanks to its new bank of data.